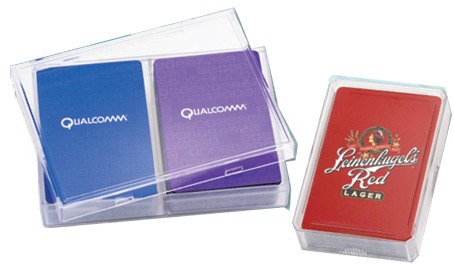 Showcase either one or two decks of your customized playing cards with your company logo in this sleek, clear acrylic box. You can have this branded playing card gift set with Bridge or Poker size decks. These branded/logo playing cards make a great promotional item or company giveaway. *Imprint not available on top of case. It's easy to have branded corporate playing cards with your company design or logo. Simply call 1-800-233-0828, and submit your camera-ready artwork to (you can also mail or fax your art). Delivery time is about 3 to 4 weeks. Rush delivery is available for an additional charge. For a FREE Catalog or more information on our other Custom-Imprinted Promotional Products, please contact us at 1-800-233-0828.